Brian and I both work remotely, and people always ask us how we do it. And when they ask that question, they usually mean, “how do you work in a small space together all day without driving each other crazy?” Which is a totally fair question! And sometimes we do drive each other a little nuts. But, we wouldn’t have it any other way. Here’s how we make it work. Before we moved onto our boat, we had a two-story condo with plenty of room to spread out (we literally worked on different floors). Now that we’re living aboard, things are a little trickier. Luckily, we were able to find a boat with an enclosed mid-deck that Brian can use as his office. We set up my desk in the main living room (in between the tiny kitchen and the tiny entertainment center), so I work inside, while Brian is happy to work from the deck – where the best views are! My little office fits perfectly between our kitchen and entertainment center. Most importantly, we’re separated by a door. So, if I’m writing and Brian’s on a sales call, it’s no big deal. Brian's office definitely has the best view. His desk also turns into our dining room table! Working from home means that the line between work and the rest of our lives gets blurred on the daily. One minute the two of us will be lost in a project, and the next we’ll be laughing about a funny text message one of our friends just sent or making plans for happy hour. · Keep it light! When work gets stressful, we try to remind ourselves that our lives are AWESOME. We live on a boat, work remotely, and get to hang out with each other (and Indy) all day! I think if I were the only one who worked remotely, I’d get really lonely, so I’m incredibly grateful to have Brian here. Plus, having my best friend around all the time is just super rad. 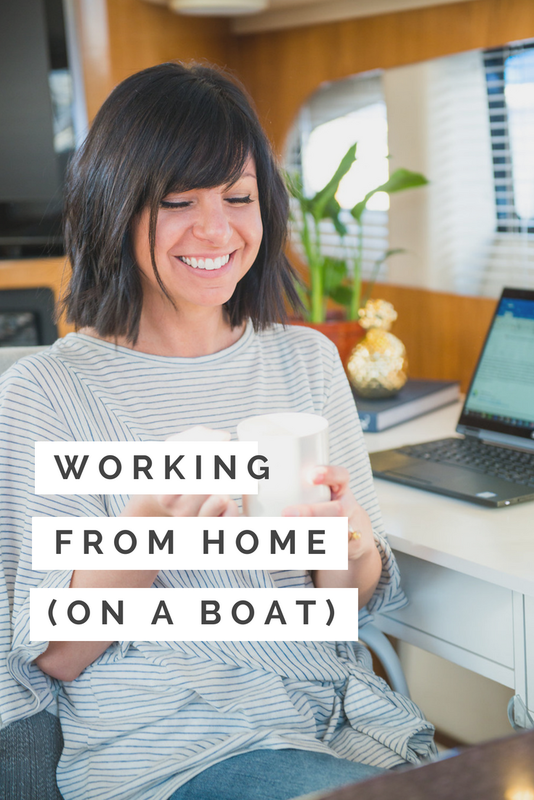 Working from home wouldn’t be an option for anyone without technology (duh), and I’m so grateful that we’re able to connect to the outside world from our boat. Thankfully, our harbor master allowed us to run an AT&T cable from the dock, so we have WiFi. It’s not the strongest signal, but it gets the job done. We also have pretty solid cell reception, so if the internet goes out, we can use our mobile hotspots instead. Things will get more interesting once we start taking the boat out for longer trips. We’ll need to do some research in advance on local coffee shops with strong WiFi signals! Living aboard isn’t that much different from living in a house, but we do have less space and a weaker internet connection. So, if we lose WiFi or start going a little stir crazy, it’s important to have a backup plan. I’ve scored an open invitation from my parents to work from their house (they’re just 15 minutes away) – thanks, Mom and Dad! And we know of several coffee shops that’ll gladly share their WiFi password with us. I’m also looking forward to those summer days where we grab our laptops, turn on our mobile hotspots and work from the beach! It’s been about three years since I started working from home, and now I couldn’t imagine going to an office every single day. I don’t miss the commute, the unnecessary meetings, or having to put on real pants before 9 am. These days, our mornings usually consist of a quiet walk around the dock with Indy, coffee on the flybridge, and an early yoga practice before work (which we usually do in our PJs). Even better? All that time we save on commuting and getting ready makes us way more productive. And if we’re able to wrap things up early, we always have the option of throwing off our lines and heading out for a sunset cruise around the beautiful bay!